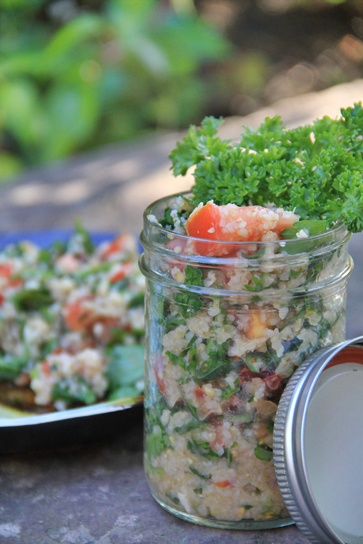 Tabbouleh is a healthy, rich and super-green salad with pure Lebanese origins that is known for its spicy-tangy kick. In traditional Lebanese cuisine this salad is made with burgur- cracked wheat. And on the topic of bulgur, if you are allergic to gluten or simply want a gluten-free version, try substituting the bulgur with Quinoa. We haven’t tried it yet, however I heard from a few folks that it’s a good gluten substitute. Add one cup of boiled water and one cup bulgur in a small bowl and mix. Place a tea towel over the bowl so the steam is unable to escape. Set aside until cool. 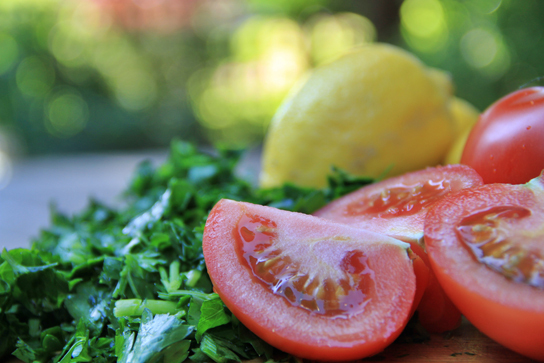 Finely chop the parsley and tomatoes and place them into your separate large salad bowl. Place over the cool bulgur and mix well.